If you’ve been on Pinterest lately or tried to look up a new recipe, then you know overnight oats get all the glory. And why shouldn’t they? They’re quick, easy (don’t tell Mom) and you can make them the night before. Although we’re loving the new trend, we can’t help but mix things up a little. We’d like to introduce you to overnight chia! Similar to its distant cousin, overnight oats, chia pudding is the perfect post-workout, pre-work breakfast to keep you going – and yes you can make it in a mason jar. Why convert to chia? Aside from being famous as cha-cha-cha-chia pets, these bad boyscontain healthy omega-3 fatty acids, carbohydrates, protein, fiber, antioxidants, and calcium. It’s no wonder “chia” means strength. So go ahead, give it a go. We promise your taste buds won’t be disappointed. Step 1: Place all the ingredients for the pudding into a food processor – chia seeds, coconut milk, banana, vanilla, almond butter, cinnamon, and honey. Blend until smooth. Equally distribute between 2 bowls and cover in the fridge overnight. 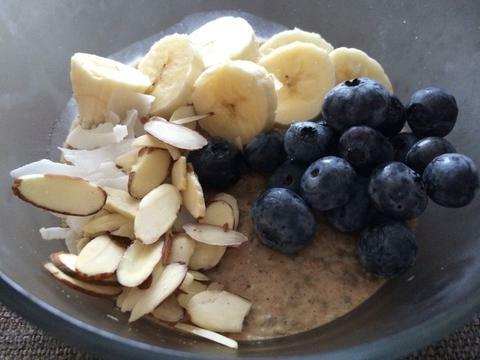 Step 2: In the morning, sprinkle with toppings – banana, almonds, blueberries and shredded coconut. Always an option to mix it up and try out your own mix of toppings! We’d love to see what you come up with so share a comment or post a pic to our Instagram #FitKitLife.